When I was living in Japan the first time I begged one of the teachers at the school I was teaching in to teach me how to cook Japanese food. She dutifully came round to my apartment and under her supervision I crafted a beautiful Japanese meal, so precisely served and garnished, and presented like a masterpiece… Suffice to say I’ve never hit that level of perfection since! However, Mida-sensei gave me a wonderful introduction to cooking my own Japanese food and the recipes she taught me are ones I turn to again and again. This one is quick and convenient and I always turn to it when I find I have a random leek left in the fridge or am just feeling nostalgic for Japan. 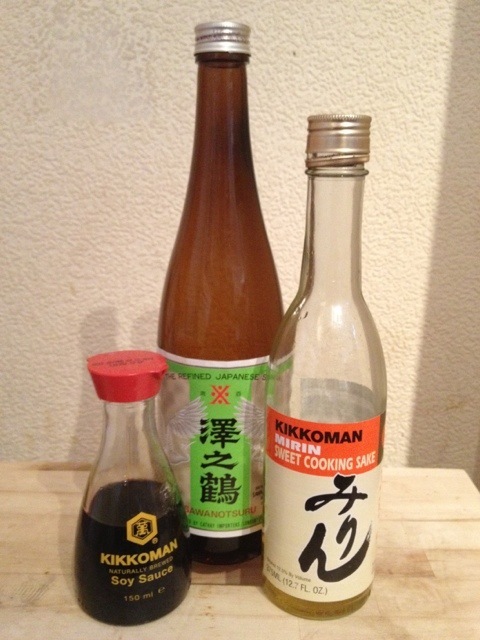 – Put the dashi, sake, mirin, soy sauce and sugar in a sauce pan and bring to the boil. – Pat the chicken thighs with corn flour, coating well, and discard the excess. 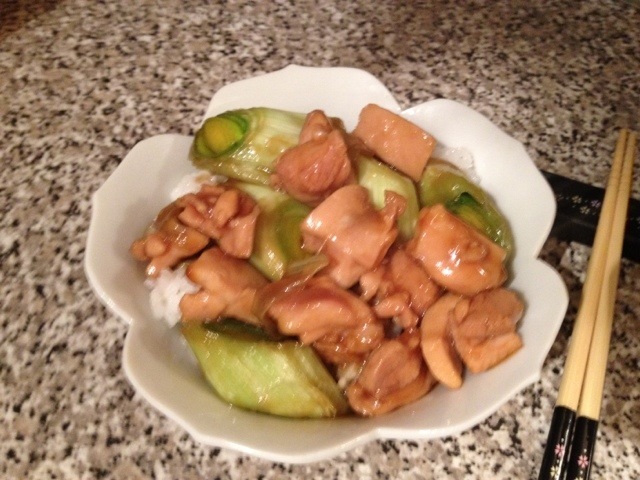 – Put the chicken in the sauce and simmer for 5-6 minutes, stirring occasionally. 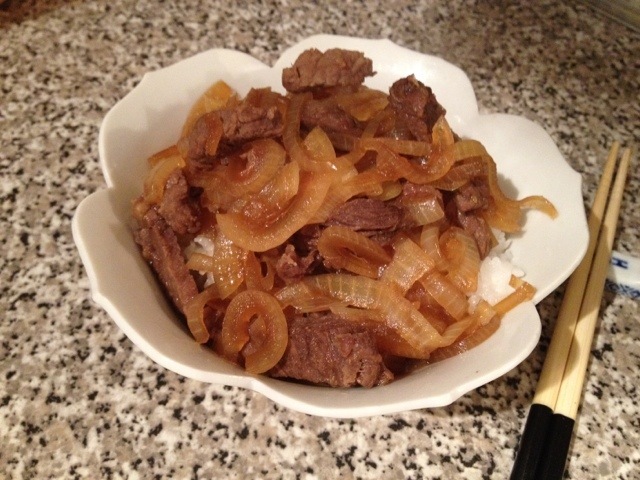 – Add the leek and cook for a further 4 minutes. – Serve with sticky rice. A little bonus Wednesday post here for Japanese Week, I had leftover rice so decided to whip up this quick recipe. I think that three recipes in a row counts as a theme! It may not look that pretty (for which my apologies but I was very hungry and didn’t want to mess about) but this is a very tasty use of leftovers. It sounds like something a toddler might come up with, rice mixed with ketchup (my own sister lived off that for about a year as I recall) but this is actual food! 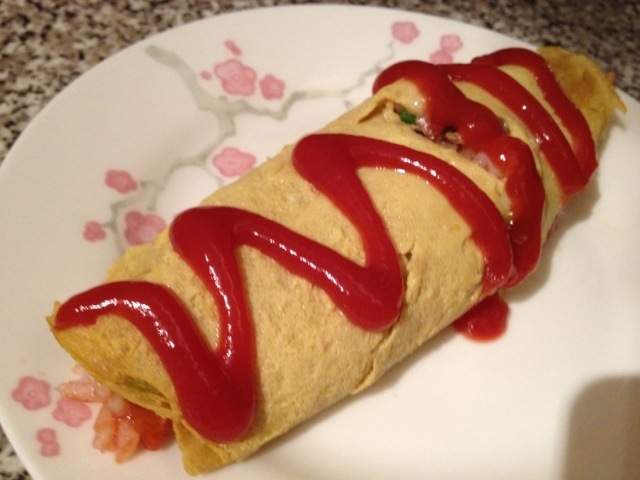 It has vegetables and a nice wrapper of omelet to keep it tidy (and put some nice balanced protein in there). And to prove it it is served in cafes, restaurants and canteens all over Japan. It is another thoroughly everyday meal, obviously invented to use up leftover rice, but which has become a meal in its own right. You can make this with any rice, Japanese or basmati and the vegetables can feature as much as you like or disappear completely, it just depends on what you have in the fridge! – Mix all of the ingredients for the egg sheets together and whisk thoroughly. – You can either use a lightly oiled pan to cook it or microwave it using a lightly oiled dinner plate. You simply tip half of the mixture onto the plate, swirl it around and cook on high for about 1 minute 30 seconds. Keep cooking until the middle is set. Then, very carefully, peel the egg sheet off and cook the second half of the mixture in the same way. – Mix the rice, ketchup and vegetables together. – Place a heap of rice in the centre of each egg sheet and wrap the egg around it. – Carefully transfer it to a plate, seams down, and the decorate with a zig zag of ketchup. Well, this cake essentially does what it says on the tin. It is a cake that both contains and tastes like Malteasers, and what’s not to love about that! 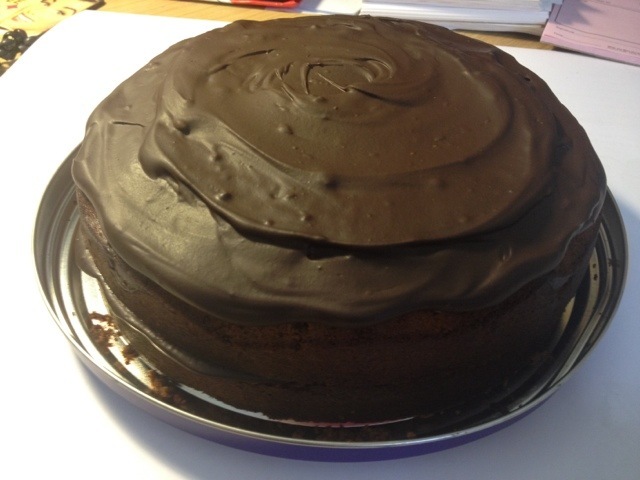 It was a big hit in the office with lots of diets being totally scuppered that day, I call that a win! I would have decorated the top with more Malteasers but I ran out. I refuse to confirm or deny whether that was because I ate them while the cake was baking. I would also have taken a better picture at home rather than at my desk but, once again, I forgot! – Heat the oven to gas mark 4 and grease and line an 8″ cake tin. – Add the eggs one at a time, beating well between additions. – Add the vanilla and mix well. – Fold in the Ovaltine and flour. – Mix through the milk so the batter isn’t quite so stiff. – Crush the Malteasers and stir through. – Pour the batter into the cake tin and smooth out, making a dip in the centre. – Bake for 40-50 mins. (My oven is going haywire at the minute so check from 40mins but it will probably need longer.) Cover with foil if it starts to go too brown. When a skewer inserted in the middle comes out clean it’s done. – Remove from the oven and cool on a rack. – Split the cake in half. – Place the chocolate in a pyrex bowl and melt over a small pan of boiling water. – Once melted add the cream and stir vigorously until you have a glossy ganache. Set aside to cool a little before using half to fill the middle of the cake and half to ice the top of the cake. Use the back of a spoon to swirl out to the edges nicely. – Decorate with additional Malteasers if you didn’t already eat them! 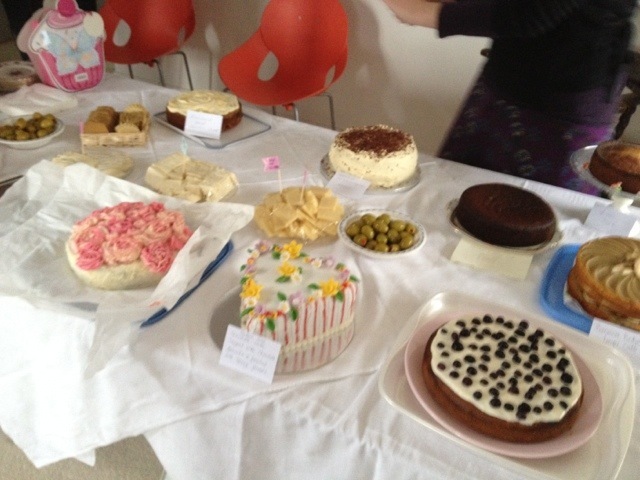 On Saturday I attended my first Clandestine Cake Club. In essence: a bunch of strangers bake a cake and then turn up somewhere to eat lots of cake, chat to people and drink tea. I think we can all agree that this is my kind of shindig! This idea was the brainchild of Lynn Hill, she of my Secret Tearoom Adventure last year. And, again, I had a great time. I hope to see some of the ladies I met there again as I shall certainly be going to another CCC event very soon. If there is one in your area I urge you to give it a go. Especially if, like me, you’re looking to expand your social circle, or just eat loads of cake! Everyone is there for the same reasons so you’ll never find youself hiding in a corner and the conversation can easily be kicked off with “So, which is your cake?” like nervous parents at the ballpool! For reference, mine was the Blueberry Cake in the bottom coner there. Chosen for a. deliciousness, and b. ease of transport in a car. Let me just tell you from bitter experience that roundabaouts and layer cakes rarely end well! I found this recipe on the Good Food website and I have to admit that I was sceptical but it seemed like a good jumping off point. 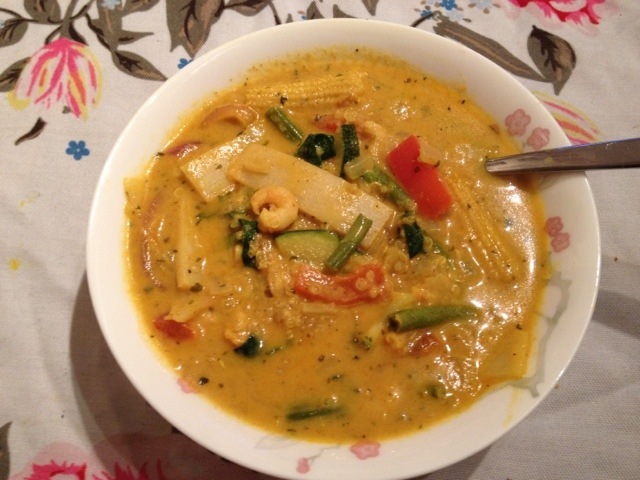 I took the idea of using milk and curry paste added a sachet of coconut cream to give a little extra richness. I love the flavour of coconut in savoury food but the price of coconut milk at the moment is extortionate so wanted to see if this alternative would work. I’m pleased to say that it did. Filling, flavoursome and delicious this recipe is a real winner! – Heat the onion and curry paste in a large saucepan with a splash of water. – Add the coconut cream. – Warm the milk in the microwave (or in a small pan) before adding to the pan. Do not add cold milk, it will curdle. – Bring to a light boil. 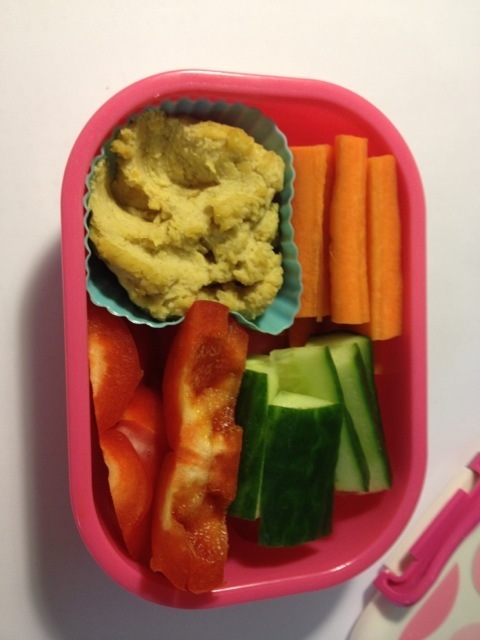 – Add the quinoa, prawns and the vegetables. – Give a good stir round and simmer for about 15 minutes (check your quinoa packet for timings). You want the little white swirl to have uncurled. 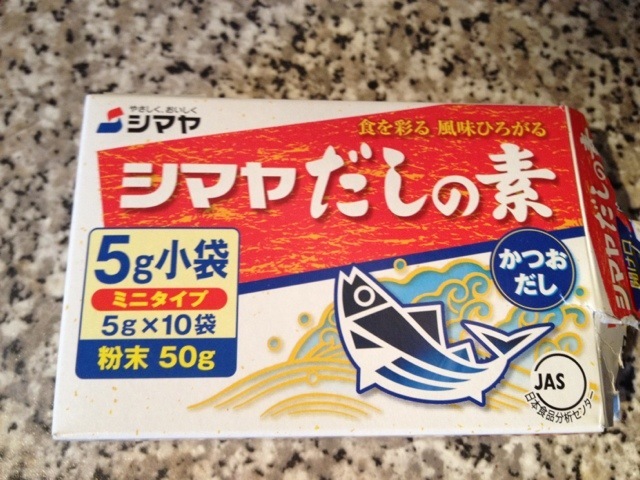 – Add the fish sauce and add plenty of salt to taste. – This will be really hot so leave to cool for a little while, the quinoa will soak up more of the liquid too so it won’t be as soupy.